Volume 1 of the publication, the Desk Reference, provides a detailed description of new urban and person-based trip data, summarizes key instructional information, presents sample plots, and identifies significant changes from the previous edition. It also contains definitions of the independent variables and terms used in this manual. 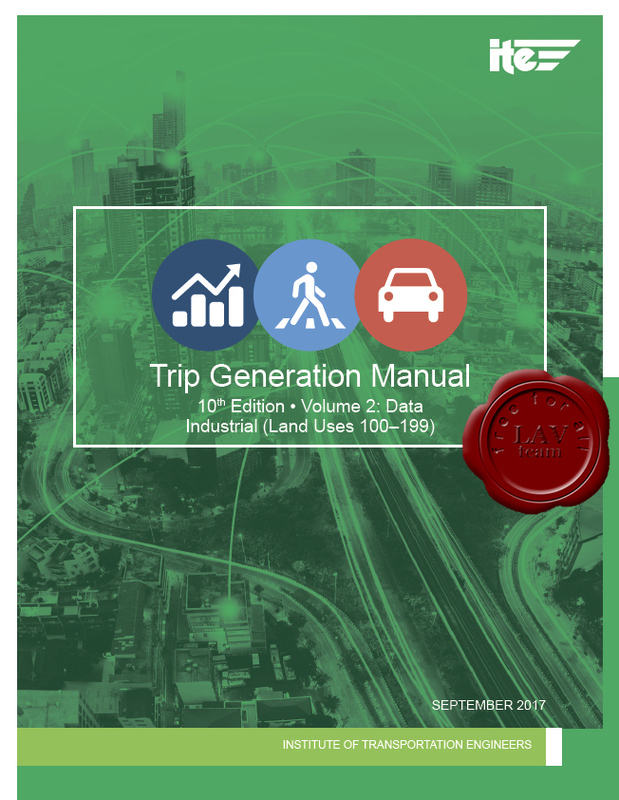 Volume 2 of the Trip Generation Manual includes a complete set of searchable electronic PDF files including land use descriptions and data plots for all combinations of available land uses, time periods, independent variables, settings, and trip types (vehicle or person). All person trip generation plots are displayed with shading to clearly distinguish them from the vehicle trip generation plots. Volume 2 has been divided into 10 parts in accordance with the following land use categories: Port and Terminal, Industrial, Residential, Lodging, Recreational, Institutional, Medical, Office, Retail, and Services. Within each of the 10 parts, the land use descriptions and data plots are ordered in accordance with the following criteria: land use code, trip mode (vehicle or person), setting/location, independent variable, and time period. Data contained in Volume 2 are prepared for informational purposes only and do not include ITE recommendations on the best course of action or the preferred application of the data. The information in Volume 2 is based on trip generation studies submitted voluntarily to ITE by public agencies, developers, consulting firms, student chapters, and associations. Users are encouraged to review and become familiar with the Desk Reference prior to using the data contained in Volume 2. The Trip Generation Handbook, 3rd Edition is also included with the Trip Generation Manual. The Trip Generation Handbook, 3rd Edition (Publication Number RP-028D) replaces the Trip Generation Handbook 3rd Edition, An ITE Proposed Recommended Practice (Publication Number RP-028C, August 2014). This report has the following two primary purposes: to provide instruction and guidance in the proper use of data presented in the Trip Generation Manual and to provide information on supplemental issues of importance in estimating trip generation for development sites. The updated Handbook provides new guidance on proper techniques for estimating person and vehicular trip generation rates, updates guidance for the evaluation of mixed use developments and the establishment of local trip generation rates, and expands pass-by trip and truck trip generation data.